This morning Doctor O broke the news through Twitter of Cardfight!! Vanguard Link Joker's climax set, VG-BT15: Infinite Rebirth. Sharing its translated English name with the anime's fifth opening, OP05 無限∞リバース the kanji literally translates as "Infinite Reincarnation." The set will feature support for the Link Joker, Gold Paladin, Shadow Paladin, Kagerou, Aqua Force, Megacolony and Pale Moon clans, and will be released in Japan on February 28, 2014; to the date, this will be just two days after the three year anniversary of the Trading Card Game, for which the first trial decks were released on February 26 of 2011. Infinite Rebirth is anticipated to feature an overhauled Megacolony, bringing revisions to the clan that have been discussed since their core mechanic was functionally overtaken by Lock. The artist credited for the set's cover card is Oobari Masami of STUDIO G-1NEO, the same famed mecha artist who previously illustrated Super Dimensional Robo Daikaiser as well as his and Daiyusha's alternate artworks. Oobari has been heavily associated with Super Robot-genre anime and the Super Robot Wars video game franchise, but since creating Daikaiser has been putting a lot of work into Cardfight!! Vanguard, most recently at Bushiroad's Anime Festival Asia Singapore 2013 booth where he did interviews, photo shoots and signings. Update 11:50 AM: VG-BT15's set size will be 102 cards, with 8 RRR, 12 RR, 22 R, 60 C and 12 Special Parallel cards. Additionally, it will introduce a new rarity, with a single card being ЯЯЯ "Triple Reverse" rare. The specifics surrounding this card are unclear, but it will be available through Monthly Bushiroad and will involve the Gold Trigger campaign. The set will feature Aichi and Kai's key cards from Link Joker's finale, and strengthen cards originally introduced in VG-BT10: Triumphant Return of the King of Knights as well as those from trial decks VG-TD08: Liberator of the Sanctuary, TD10: Purgatory Revenger and TD11: Star-vader Invasion. Based on the specific mention of cards from these sets and the appearances of some of the units shown above, it can be inferred that the new units include a crossbreak ride for Shadow Paladin's Illusion Revenger Mordred Phantom, as well as supporting cards for Liberator of the Round Table Alfred. 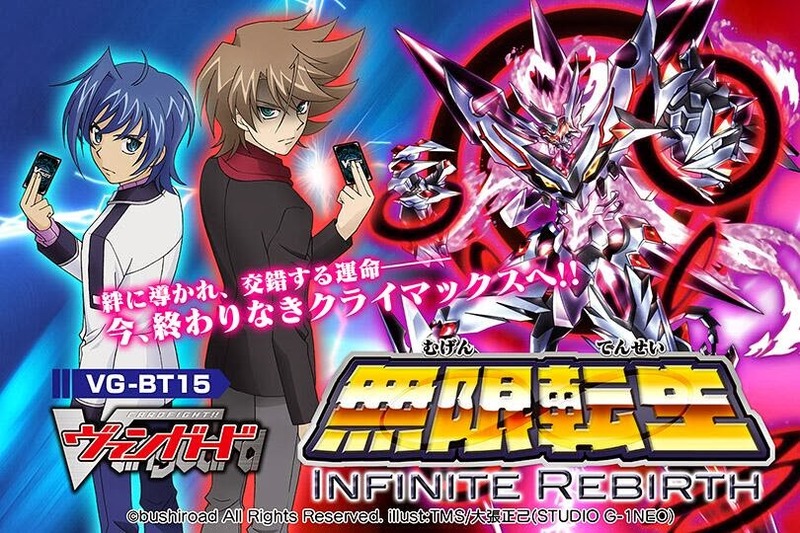 The cover card for Infinite Rebirth also invites comparison to the unit Takuto used in ride 127 and that Kai subsequently envisioned himself playing, which the mention of Star-vader Invasion would set up as an Infinite Zero Dragon crossbreak ride. The anime suggested its skill could lock between 4 and 5 rearguards. The unit's motif of rings-within-rings draws also back to the image of Link Joker's "universal soul," three rings within one another which form an eye. A special edition of the set will also be packaged with the next volume of MiniVan DVD and a promo card illustrated by MiniVan artist Quily. AEON Mall Makuhari New City concept image. Meanwhile, Friday evening it came to light that Bushiroad will be opening a new store in AEON Mall Makuhari New City, a highly anticipated concept mall that will open on December 20th. AEON is a retailer chain in Japan, China, Vietnam, Indonesia and Cambodia whose newest mall is intended to be filled with additional entertainment beyond the standard shopping experience, as well as event spaces and custom stores. Strategically located close to Kaihin-Makuhari station, Makuhari New City is AEON's flagship mall, built in the very same Chiba city that houses the company's headquarters, AEON Tower. The placement of the new "Bushiroad Store" within AEON's crown jewel sends a strong message, making it out as a symbol of the company's economic prosperity in latent years--compare Nintendo's line of Pokémon Centers. It will open on the same day of New City's grand opening, keeping hours from 9:00 AM to 10:00 PM on the third floor. The store will house TCG products and supplies, character goods, as well as My Little Pony and New Japan Pro Wrestling merchandise. 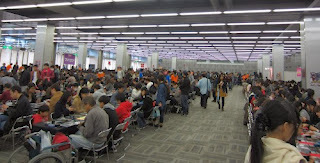 The space is also planned to be used for events related to Bushiroad's TCGs. 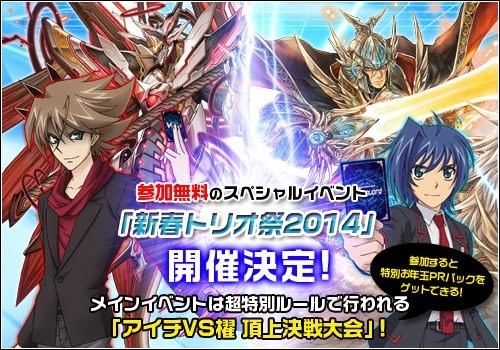 Bushiroad of Japan has also announced special rules for the New Year's Trio Festival 2014 tournament, to take place at the beginning of the next year. This triples format tournament will divide teams into Kai and Aichi group, each with their own special deck construction rules. Kai group team members must either include “Я” cards in their decks or use four or more Link Joker cards in construction, while Aichi team members may not use “Я” units or Link Joker. The theme of the event is built up as "Aichi VS Kai, Showdown at the Summit" intended to organize a climactic battle between the forces of Void and Cray. Online registration will open on December 17th, after which applicants will be mailed their letters of invitation to the tournament. The tournament will be a three-versus-three format, with each fighter playing a single 20 minute game against their corresponding opponent. Out of the Aichi group and Kai group blocks, four teams from each will be selected for the top 8. Three rounds of Swiss will see each team scoring points from their wins or losses to determine which four teams will make it out of each block. Trio Fest 2014 will be held at Tokyo Prism Hall on January 13th, 2014. Prism Hall is a familiar location to Bushiroad, as it was previously used to host the Fighter's Climax 2012 national tournament a little under two years ago. In other news, Bushiroad USA released the names and decklists of the North American, European and Asia-Oceania continental championships' respective top 4s through the English Cardfight portal and Facebook earlier this week, providing a look at the upcoming World Championship 2013 finalists. The WCS2013 finals will be taking place on January 12, 2014 in Tokyo, and will see the respective top 4, top 2, top 3 and national champion of North America, Europe, Asia-Oceania and Japan facing off for the world title. Incumbent national champion Albert Lee seized his title with a more developed form of Dragonic Overlord the End deck, incorporating Dauntless Drive Dragon as its supporting break ride just two days after the card's release in VGE-BT11: Seal Dragons Unleashed. (The North American finals took place on October 27th.) Albert Lee had previously qualified for the national championships through taking first place in Hawaii's qualifier, using a somewhat unconventional PRISM decklist using Charlotte and Fundy that had received no small amount of criticism. Although not an especially radical deck when compared to such departures as preceding national champion Kaden Kawakmi's DOTE, Lee's build does stand out for more than being in first place. Red Pulse Dracokid is a card that is commonly put down in favor of the tried and true Lizard Soldier Conroe, as Conroe is useful in a variety of situations whether he's searching for an effective boosting unit, tech cards like Heatnail Salamander or Aermo, a perfect defense card, or bypassing grade 1 lock. All of these positive characteristics have been negatively contrasted by the community with Red Pulse's low percent chance to search for a grade 3 from the top 5 cards of the deck for a similar cost. Those in favor of Red Pulse have argued for a long-term strategic value in that even when Red Pulse fails, because the grade 3 was not in the top 5 cards of the deck, and the cardfighter using him was unlikely to go through more than 5 cards within the next turn, the subsequent shuffling of the deck opens up more opportunities by taking away a known negative situation for a potentially better one--which it can be argued is worth the one card loss in card advantage. As Red Pulse's search skill also has synergy with both break ride and persona blast skills, the card does have a convincing case as one option for The End cardfighters. Considering DOTE's international legacy, Lee's use of Seal Dragon triggers is also surprising because his deck does not make use of Seal Dragon Corduroy's especial counterblast. Contemporary cardfighters in Japan like 2013 junior national champion Niida Kazuki and VF Koushien Hiroshima champion Okabe Mizuki have adapted Corduroy at 4 to take advantage of the cheaper retire that leaves more room for The End's persona blast to threaten the opponent with. In Lee's deck this is instead dealt with through Bellicosity Dragon, Kagerou's damage unflipping grade 2 and one more unit that the opponent does not want to let through but must concede on because of the threat of The End's persona blast. Probably the most subtle difference in the deck is the 3 Burning Horn Dragon, which on the surface is a minor point but will look strange to veteran fighters. Since the Overlord deck's introduction to the world in December 2011, Burning Horn has been a staple card run at 4 in the majority of DOTE decks. With the introduction of BT10-on in Japan however, Burning Horn has been gradually scaled back in favor of grade 2s with skills, like Bellicosity in this list. The same transition is now taking place, reflecting the shift away from base 10000 vanguards, and the resulting decreased importance of the 20000 power line. Cards like Burning Horn are not likely to go away because their empty 12000 swings are still very useful in the early and midgame, but they are no longer 4-card staples in the decks with other options. Decklist name: What are you running? Exodia! !